Kit including Toe rods, Polybushes, Brackets and Mounting Hardware. Eliminates weak or faulty standard components. The First kit of its kind on the market. Fits ALL HICAS equipped cars, including R32GTS-t, R32 GTR, R33 GTS-t, R33 GTR, R34 GTT, R34 GTR, S14 Silvia, S15 Silvia, S13 180sx, S13 Silvia, A31 Cefiro, A33 Laurel, Z32 300ZX and more. 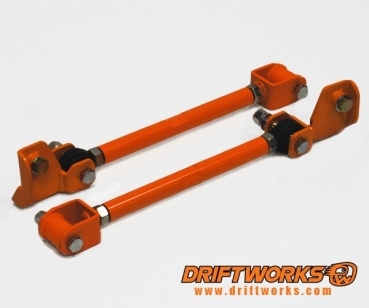 The Driftworks Total HICAS Eliminator. We all know how fragile the HICAS rear steering system is on RWD Nissans. 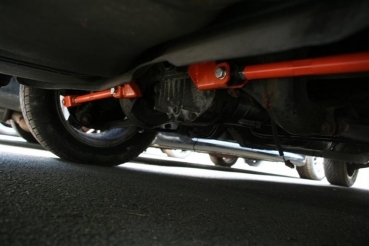 If it's not the incredibly weak outer ball joint that breaks, it's the tie rods. Either way you end up with play, causing unpredictable handling and MOT failure. 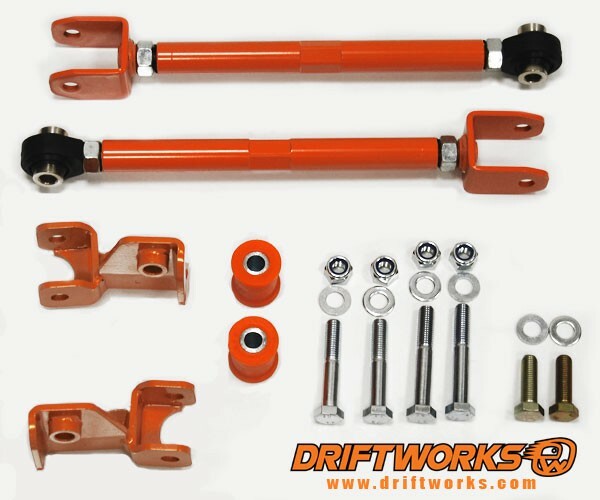 This comprehensive Driftworks HICAS Eliminator kit removes every part of the flawed Nissan system, replacing it with fully adjustable, heavy duty rosejointed toe control arms giving precise adjustment and confidence inspiring handling. The tie rods and ends are replaced with a heavy duty toe control arm, this gives full adjustability, and uses high load 3 piece teflon lined Japanese bearings. These are not service items as some other manufacturers use, they are fit and forget self lubricating rose joints specced for the European roads. The outer ball joint is replaced with an uprated Driftworks Polyurethane bush completing the removal of every part of the HICAS system.